A quick search on Amazon.com for “diet books” reveals over 20,000 books, many purporting “quick results” with a recent fad diet. Over the years, many of these diets have contradicted themselves such as the low fat diet that began in the mid-1970’s and the current Keto diet. Do these diets sound familiar? So which diet is the “healthy” one? 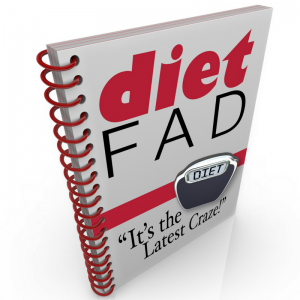 A study conducted in 2007 indicated that many of these fad diets are written by amateurs with have little or no expertise on the long-term effects of a specific diet (Ruden, Rasouli, & Lu, 2007). If a physician or professional endorses a diet, I have noticed that they have some kind of financial gain involved (i.e. they are trying to sell you something). Well, that’s because I am. I like research and facts (and not the research conducted by people who are promoting a certain plan) and I am tired of people trying to convince me that ANY quick weight loss fad is easy, healthy and sustainable. As a matter of fact, Bishop (2001) conducted a study and determined that people who choose fad diets are more likely to gain weight back than those who followed a healthy lifestyle. The folks who followed a healthy living plan, lost weight slower but were able to keep the weight off without additional lifestyle changes. What does this mean for you? If you are interested in long-term change and a living a healthier life, make a solid goal, and follow a healthy living plan! Here are TIPS from my 90-Day Health and Happiness Program on how to create a STRONG GOAL! Make goals measurable and SMART. This is the step that most people do and think that they are done making their goals. Your final goal should be measurable so you know when you’ve achieved it! Break goals into smaller steps. Now that you have a solid measurable goal, break it down into measurable steps that you will take to accomplish this goal! This is the HOW part of your goal. Personally, I break down a very large goal into 12 big (monthly) “chucks” and then further break each monthly “chunk” into 4 (weekly) steps. Then, on Sunday night or Monday morning, I look at my schedule to see how I will fit the weekly “chunk” into my week. Monthly: I will run 12-16x each month and participate in at least 4 cross training activities. I will follow my physical therapists, running coaches, and doctors’ advice/schedule. Weekly: I will run 3-4x/week and go to 1-2 strength-training classes or routines. I will do my PT exercises 3x/week. I will have 1-2 days of rest. I will add these to my calendar and schedule all activities around them. Daily: This is the easy part. If it’s on my schedule, I will make it happen! How did this problem begin? It may benefit you to think about how this bad habit/lifestyle/problem developed. Is there a problem you need to address? What personal need did that problem fulfill? These questions, although difficult to think about, impact the success of your goals. Write down WHY you want to accomplish your goal. This is the carrot at the end of a string dangling in front of you when your motivation at an all time low, and you just want that donut! What is the good reason that you are accomplishing this goal? Write down all of the reasons and keep it handy! This needs to be a big, juicy carrot! Make sure it’s sustainable. Do you know why goals fail? Because people give up a habit or behavior without filling the void with a healthier alternative! Set up a list of skills and strategies you will use when you are struggling. Behaviors are difficult to correct so plan for these challenges. Be flexible, grab a friend, and have FUN! You may need to modify your goal after the first few weeks. That’s okay! Just don’t throw in the towel! Grab a friend or another person who will support you in your goals! We all need help to stay motivated. Just make sure you choose someone who is as committed as you. If you are struggling to establish a healthier lifestyle, please sign up for a FREE 30-minute consultation and I will happily tell you about my 90-Day program. Grab a friend and get healthy together!